This ToP facilitation case study from the archive was first written for and published in 2008 by ICA:UK. The ToP Focused Conversation and Consensus Workshop methods are the focus of my upcoming Group Facilitation Methods course in Brussels, May 20-21. The ToP Historical Scan (Wall of Wonder) method features in two of my current projects, Celebrating the development of facilitation – world-wide and history long and Our ETF, a Journey Together. The process design and questions used were structured on the basis of the ORID model of the ToP Focused Conversation method (my ‘universal principle of facilitation‘). When ICA:UK was approached in early 2006, investments had been made in recent years in strengthening clinical leadership within the then South Manchester Primary care Trust (PCT). These included the introduction of cluster working, and three Cluster Directors, to support extended primary care teams in multi-disciplinary and multi-agency working; and the creation of an in-house Education, Learning and Workforce Development Team, with a Practice Nurse serving as Clinical Lead. Considerable further change was required and underway, including Agenda for Change and the merger of the three Manchester PCTs (South, North & Central). to engage with and involve people in an inclusive and transparent way, that fosters a sense of ownership over the process and its outcomes. A series of tailored workshops was designed and delivered to meet these aims. The process drew heavily on ICA’s ToP (Technology of Participation) methodology, notably the ToP Focused Conversation, Consensus Workshop, Action Planning and Historical Scan (or Wall of Wonder) methods. In your experience, what have been 4 or 5 key events or milestones in the development of clinical leadership in SMPCT in the last 3 years? Please include dates (as best as you can). What are you particularly proud of, and sorry about, in relation to the development of clinical leadership in SMPCT? Please list a few positives and a few negatives. Please use examples or anecdotes to illustrate your points if you wish. In your experience and understanding, what are 4 or 5 key factors affecting clinical leadership development in the PCT? For example – what do you think supports, and what blocks, the development of clinical leadership? What 4 or 5 actions or changes would you recommend to support the development of clinical leadership in the PCT in the future, and address any blocks? Feel free to suggest simple, one-off tasks or more complex, long-term projects – but please be as specific as you can. A final half-day Review & Planning workshop was held the following week, for a representative sample of the three groups (approximately 20-30). This workshop was designed to enable the group to reflect together on the output of the first three workshops, and agree an outline action plan for clinical leadership development within the PCT. The process used was documented in a Process Outline (June 16th 2006), and its outputs were documented in two reports, of the Consultation process (July 6th 2006) and of the Review & Planning (July 26th 2006). Seven months on from the workshops, in early 2007, it was clear that the four groups had all met at least once, that their plans had progressed at least to some extent, and that at least some others had become involved. The context of the work had changed significantly, however, with the merger of the three Manchester PCTs into one from October 2006, and with expectations of increased multi-agency working with for example Childrens’ Services & Adults’ Services, and also privatised services. A new Associate Director of Services & Development had been appointed, whose remit was to include clinical leadership development across the new PCT. These aims were met by way of two related pieces of work. An initial email questionnaire was circulated in February, to all participants and invitees of the process to date, to discern their experiences of the process and their perspectives on progress made, barriers experienced, and learnings. A follow-up workshop was then held in March, to bring together the four task-forces and any email contributions received with the new Associate Director – to report on and celebrate progress made, to learn from experience, and to consider implications for themselves as individuals & leaders, and for the new Manchester PCT. As far as you know, what have been 2 or 3 key events or accomplishments that have occurred as a result of last July’s consultation and planning process? As far as you know, what have been 2 or 3 barriers or blocks that have hindered implementation of the plans made last July? What have you as an individual learned as a result of your involvement in this clinical leadership development work since last July? How has that affected you personally, or your work? What would you identify as the one or two key lessons for the new Manchester-wide PCT to learn from this experience, relative to clinical leadership and its development? The process used was documented in a Process Outline (February 22nd 2007), and its outputs were documented in a report (April 2nd 2007). analyse what we have, clarify what we want … and get on with it. A further indication of the impact of the process may be an increased appetite within the PCT for applying the ToP approach to participation and partnership working. A further series of Consultation workshops and a Review & Planning workshop were delivered later in 2007, on Management and Leadership Development. This adapted the format and process developed for Clinical Leadership Evaluation and Development in South Manchester to engage with a cross-section of staff of the new Manchester PCT – to begin to develop a consensus on “a Manchester way of managing”, a core set of leadership and management competencies to deliver this style, and a few priority actions for “quick wins” over the following months. Since then the approach has also been applied to review and planning “away days” with individual staff teams including the Joint Occupational Therapist Unit of Manchester Equipment and Adaptations Partnership (a joint service of Manchester PCT and Manchester City Council) and the Manchester PCT Interpretation Service. Every Local Authority in the country was tasked by the Department of Health with contracting an organisation to “host”, or administer and support, a new Local Involvement Network or “LINK” from April 1st 2008. These are to provide a new mechanism for public and patient involvement in health and social care services within the boundaries of the local authority, and to replace the pre-existing Public & Patient Involvement Forums which each dealt only with the health services of a particular NHS trust. Wigan Council was keen to consult with the various relevant stakeholders to establish how they would like the Wigan LINK to be tailored to local needs and aspirations, and what that would mean for the terms of reference for the contract with the host organisation; and in the process to build capacity for effective consultation and involvement in health and social care in the borough, and build commitment and enthusiasm to make the new structure work for Wigan. ICA:UK was contracted in September 2007 to design and deliver a process to meet these aims, having just delivered a separate series of multi-stakeholder facilitated review and planning events for the Council over the summer and autumn. In fact the aims and scope of the project weren’t altogether clear at the outset, but with the client we were able to clarify these as we developed a series of events to meet the client’s needs. A pair of half-day launch workshops were held in October, in different parts of the Borough – to launch the process, reflect on and learn from participants’ experience of involvement in health & social care in the past, and clarify the aims and scope of the project for those willing and able to get involved. Participants were invited on the basis of their potential capacity to consult between them with the full range of relevant stakeholder groups across the borough. A training day was then held in November to equip participants with the principles, methods and confidence to go out and consult with their groups in a rigorous and consistent way. A half-day closing event in early December was designed to enable participants to reflect on and learn from their application of what they had learned, to weave together the results of their consultations into a single consensus vision for the new Wigan LINK, and to identify the implications of this vision for the terms of reference of the host organisation, in terms of the skills, knowledge, attitudes & approach required to deliver it. The tailored training and consultation process we developed combined the strengths of both ICA’s ToP (Technology of Participation) methodology, and elements of the PA (Participatory Appraisal) approach as well. The training drew on ICA:UK’s ToP Group Facilitation Methods course, and also the PA4Change course developed by ICA:UK Associates Marilyn & Chris Doyle and Michelle Virgo (Zebra Collective). Participants were trained to use the ToP Focused Conversation and Consensus Workshop methods to consult with their stakeholders on “their vision for Wigan LINK – how they would like it to be”, within the framework of the PA4Change principles and approach to participatory research. Each participant was provided with an ICA:UK sticky wall, so that they were fully equipped and ready to use the methods they had learned. The ToP Consensus Workshop method was used again in the closing event to weave together the product of each of the stakeholder workshops. A total of 227 stakeholders had been consulted through 10 parallel consultations, and a total of 63 vision titles were woven together into a clear and simple nine key vision elements. The skills, knowledge, attitudes and approaches identified by the group to enable this vision to be delivered were used by the Council, with the involvement of stakeholders, to tailor the terms of reference for the host organisation and to assess the tenders received. After starting the process in October feeling that Wigan had been slow to start preparing for the new LINK and might have trouble catching up, by the end participants were saying that they felt Wigan was very well placed to get the kind of LINK it needed, and in good time to appoint the host by April. 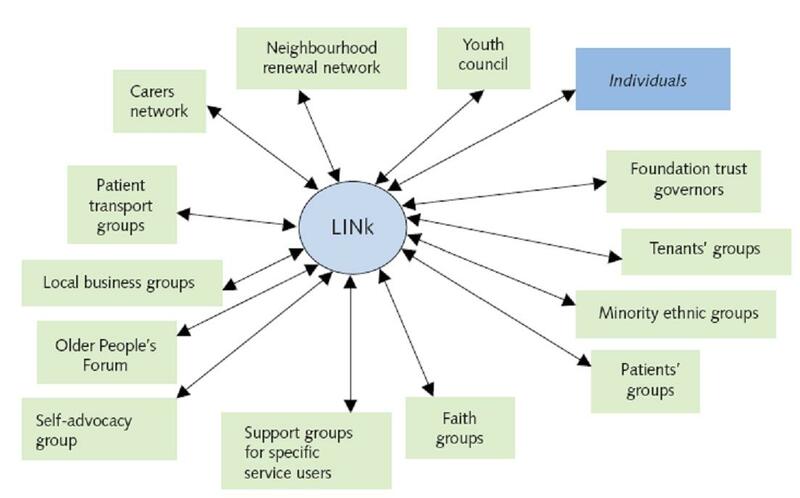 “ICA:UK took a concept that was ill-defined by the client, and translated it into a series of questions and exercises which enabled a group of community volunteers and public sector employees to enter into a constructive dialogue about the preferred characteristics for the future LINK organisation. Of equal value was their training in the use of the Consensus Workshop and Focused Conversation methods, which, albeit brief, gave confidence and enthusiasm to the participants for them to roll it out with their own organisations as they themselves sought a cross-section of views on how the LINK should operate. I am happy to recommend ICA:UK – not only for this piece of work, but also for other consultation exercises they have done with the Council, which have been equally productive”.